Today on Life in Mascara I have the privileged of introducing to you a guest writer, Emma Lawson. Emma is a passionate writer, fashion enthusiast, and lover of all beautiful things in life. Follow her on Twitter @EmmaLawson. The happiest day of your life is finally here – your wedding. However, it tends to be the most stressful period as well, considering how many things you have to do in order for everything to be perfect. The hair, make-up, and the dress, it will be so hard to choose in the full spectrum of fabulous hairstyles, make-ups and gowns. Worry not, there are a few suggestions that can help you make the perfect decision. First, make sure to have hour-long facials once a month, because they are healthy and conditioning for your skin. Second, have a peel three weeks before the wedding in case you need time to heal after a negative reaction. Last, but not least exfoliate every six-to-eight weeks before the wedding. The night before you walk down the aisle, apply a mask you normally use and leave it for 20 to 30 minutes. This will help your makeup apply smoothly the next day. Spring is all about the light, delicate shades and tones. If you prefer a classic look for your wedding, define your eyes with black eyeliner, and full lashes. Highlight and contour cheeks with light pink blush, and add a soft pink lipstick for this glamorous occasion. Pink is the perfect spring colour, which is why carnation pink lips will give you the perfect delicate look. Emphasize your eyes with lilac-grey eyeshadow and blend it into a soft almond shape. Give your eyes the ultimate dramatic touch with waterproof mascara, and eyeliner, because we all know there are going to be tears of joy at some point. Spring is the perfect time to show some skin and go for off the shoulder dress. Not all of us like the fully strapless look, so a one-shoulder dress is the great alternative. Strapless dresses are great for showing off some elegant jewelry and making the wedding look even more classy and feminine. The short wedding dress trend is becoming more popular every day. Therefore, if you choose above the knee dress, you and your bridesmaids would have the opportunity to wear dresses of matching length. The trend of matching the colour of the wedding dress with the bridesmaids’ dress is becoming more frequent. Pastel shades of candyfloss pink, baby blue, and lemon will make your girls and you look stunning. Additionally, match elegant flower girl dresses with bridesmaids’ and turn your wedding into a real fairy tale. 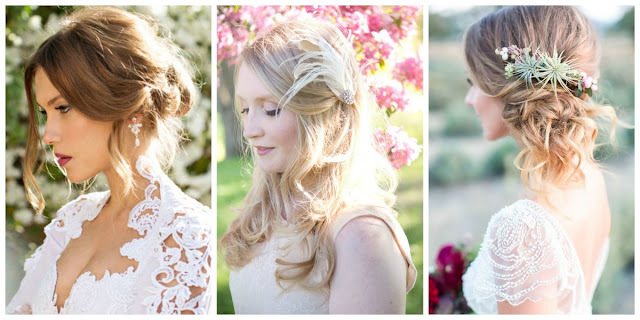 The type of your hairstyle should be well incorporated with the neckline of your wedding dress. High neckline dresses will look fabulous and very elegant with a topknot. Whether you choose the ballerina bun, or a couple of braids to add up, this hairstyle will look amazing. Nothing says classic and feminine the way a bateau neckline does. A simple low bun will be the perfect touch to this glamorous gown. If you prefer ponytail to bun, a high ponytail would look just as glamorous as a bun. If you wish to elongate your body, a dress with a V-neck will complement you the best. In order to make the best of this neckline, wear your hair down, and curl it up to make the glamorous waves. For a more casual look, beach waves will be the best choice. It is never easy to decide what look to go for on the wedding day. However, regardless of the dress, hairstyle and makeup you wear, you will look amazing without a doubt. Such pretty styles! This is awesome information. I am definitely sharing! Thanks! I hope it helps any bride out there! 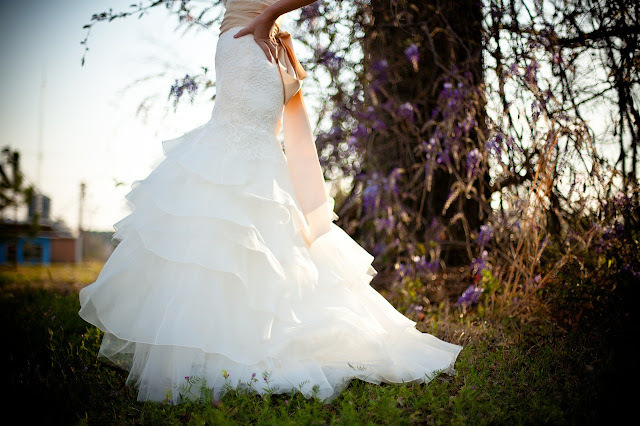 I would have loved to be a spring bride! I think spring is so pretty and whimsical. I agree. I was a Spring bride. I got married last week but I opted for a brighter lip. I wanted to look like myself and a red lip is always me. Pretty! I love all of those hairstyles! Light and effortless! I wore a messy side bun as well. I want to get married in the spring, I love the flowers and the sunset. I did and I loved it. Perfect weather!